Just like countless other good ideas, MacFamilyTree started off at a very small scale. Initially, it was intended for private use only since a family reunion was due. 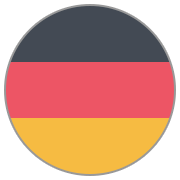 Shortly after, though, the application was released as shareware by OnlyMac Software in Germany, named MacStammbaum, on August 10, 1998. The initial releases were developed in RealBasic, a fine choice for database-driven application development in its time. Features were severely limited at that time, only rudiments like a simple display of the family structure were supported. Version 1.0 was compatible to 68k-Macs only (Macs with Motorola 68000-,68020-,68030- and 68040-Processors), version 1.6 was the first to run on PowerPC-based Macs. Several months after the last maintenance update for version 1 was released, version 2.0 hit the shelves and allowed assigning photos to a person. Several improvements under the hood as well as the switch to RealBasic 2.1 were made with this release. This version shipped with an all-new User Guide, too. 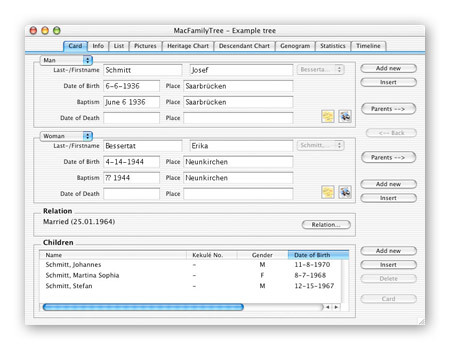 MacFamilyTree 2.2 introduced support for GEDCOM 5.5 files, allowing import and export of genealogy data with other applications. 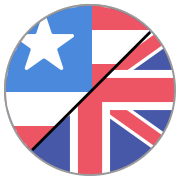 Version 3 was the first complete re-write of the MacFamilyTree code base. Development in Real Basic was suspended in favor of Apple’s new Carbon framework which allowed development of native applications for OS 8, OS 9, as well as the brand new Mac OS X, giving MacFamilyTree a more Mac-like look and feel. In 2002, after about 9 months of development, version 3.0 was announced and was supplied with maintenance updates until may, 2004. Version 3 introduced a lot of the charts that would become famous in following releases, like Ancestor Chart, Descendant Chart and the Timeline. 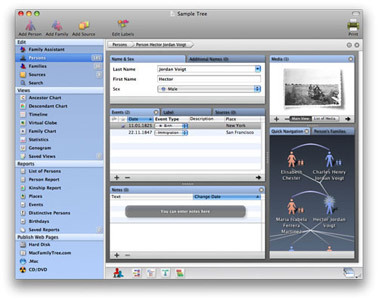 A graphical statistics feature, as well as the Genogram completed the tools for visualization of family data. Version 3 can, in hindsight, be considered the first commercially successful version in the history of MacFamilyTree. Late in 2003, development of the foundation for the next major update was started. Version 4 was the next step in tying MacFamilyTree closer to Mac OS X and the Cocoa framework - the entire code base was moved over to Apple's XCode development environment. This effectively cut off support for OS 8 and OS 9 users, but on the other hand, several of Mac OS X’s key technologies were utilized and allowed far superior performance, as well as an improved user experience. Version 4.0 introduced several new features like full Unicode compatibility, HTML export, .Mac integration, inclusion of iPhoto media and a completely reworked user interface. During version 4’s life span, a total of 50 free updates were released, the last being version 4.5 out since July 27, 2007. Version 5 marked a turning point in the history of MacFamilyTree. 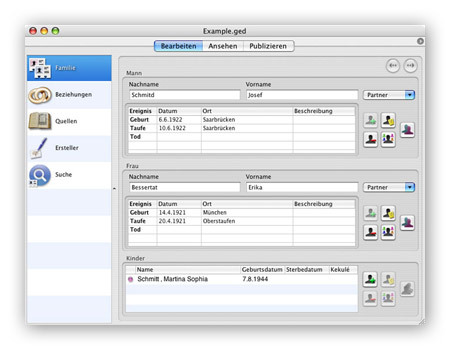 It had been developed by Synium since version 3, but distribution and anything else was handled by OnlyMac. Starting with version 5, the entire development, distribution, customer support and marketing were done in-house. Version 5 was another complete re-write to shed off some legacy limitations, utilize even more of Apple’s core technologies like CoreData and rethink the user interface design, resulting in an overall more flexible, more clearly structured and more powerful application. Launched in October 2007, Version 5 managed to attract a rush of new users, no previous version was downloaded nearly as often. And another record we broke: more than 100 free updates introduced new features while at the same time resolving known issues, improving the product quality considerably. Some of the features introduced in version 5 and given away for free to all of our faithful customers: The Media Browser (5.1), the Fan Chart (5.1), the Virtual Tree (5.2), completely rewritten reports (5.3), the new website export feature (5.4), World History (5.5), the new search pane (5.5), improved media file handling, including the recording of audio and video interviews directly in MacFamilyTree’s editors (5.6) and the new Facts and Sources handling (5.7). Another 18 months of development down the road, we were able to present version 6.0. This release was developed exclusively for Mac OS X 10.5 Leopard, 10.6 Snow Leopard, 10.7 Lion and 10.8 Mountain Lion, making heavy use of the technical advantages these two operating systems introduced. What this meant was: you get as modern a product as it gets - with 64 Bit support, newly designed user interface augmented with CoreAnimation and creation of charts in real time. Other improvements that were introduced over time include the research-assistant, the overhauled gallery and the integrated scan functionality. Worth mentioning is the introduction of a version of MacFamilyTree for iPhone and iPad that was not merely a companion app but a fully featured standalone app in 2011. 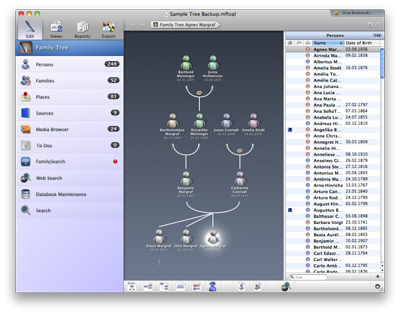 MacFamilyTree celebrated its 15th birthday in the year 2013 and Version 7 was released. We have incorporated Apple’s latest technologies, for example iCloud for even simpler and more reliable synchronization across all your iCloud-capable devices. 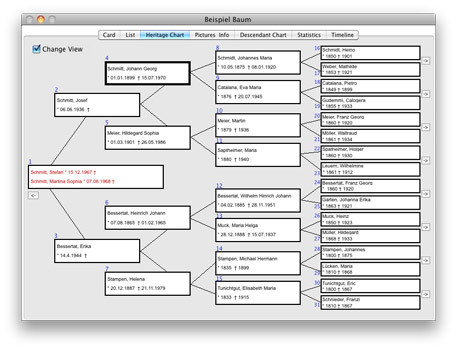 Almost every component in MacFamilyTree has been improved. We are very proud of the new mode to edit your data, the new and impressive virtual globe and the new virtual tree. 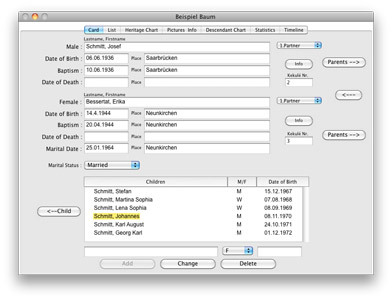 Also new and available to all MacFamilyTree users for the first time: FamilySearch, the world’s biggest genealogic database with about one billion entries. Without further charge and without having to leave the house, access a vast archive and research your family’s history. MacFamilyTree, again, is being accompanied by a version for iPhone and iPad which works alongside MacFamilyTree or as a standalone application. 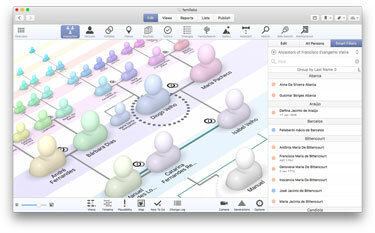 Celebrate 18 years of MacFamilyTree with us and enjoy all the new features version 7 offers. 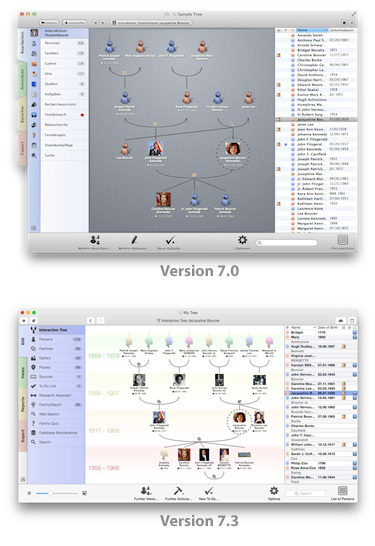 Version 7.3 has been released in late 2014 with a totally revamped user interface as a free update for all customers who bought MacFamilyTree 7. The brand new MacFamilyTree 8 has been available since the spring of 2016. Take a look at all the great updates the new generation offers! MacFamilyTree 8 brought a revolution in digital genealogy. „CloudTree - Sync & Share“ offers synchronization across any number of devices - directly from within the app, at no additional cost, and in line with the highest data protection standards. A world first in genealogy.